Perfect for your visit to Kanab! We are close to the Golden Circle and five miles from Best Friend's Animal Sanctuary. Conveniently located in downtown Kanab, walking distance to market, shops and restaurants. Sleeps up to two persons. Fully furnished main room, bedroom, and bathroom, as well as a fully equipped kitchen with coffee maker. 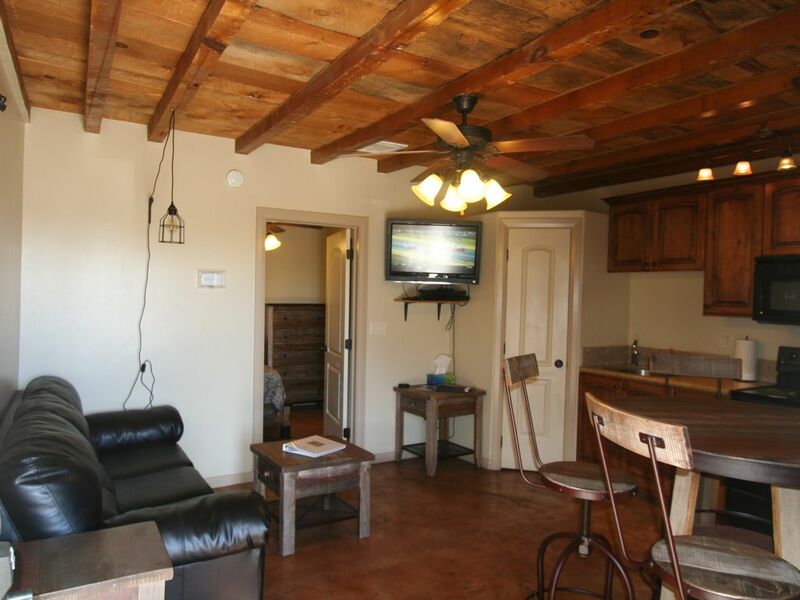 Includes high speed Internet access by WiFi, DishNetwork TV, and laundry facilities. Well behaved dogs under 55 pounds, or sleepovers from Best Friends, are welcome, additional pet fee required. We are Kanab natives, brothers and business partners. We enjoyed growing up in Kanab and experiencing the many things there are to do in the area. We are now enjoying raising our families in this wonderful area. We love to travel locally and abroad. Kanab is a wonderful location in the heart of the Golden Circle which consists of Grand Canyon, Bryce Canyon, Zion National Park and Lake Powell. Kanab also is home to Best Friends Animal Society. With so many things to do in the area we wanted to provide a home away from home for those visiting our area. Some of the unique benefits you will enjoy while staying at our property include the downtown Kanab location. We are within walking distance to most restaurants, markets, local entertainment and shopping. We provide an immaculate, newly furnished vacation home away from home for you. Bathroom is off of bedroom, has stall shower, toilet, sink/vanity, and privacy curtain. The Villa is located in downtown Kanab. You are within walking distance to restaurants, grocery store, gift shops, visitor center, movie theater, and more! Experience our famous Vermillion Cliffs, you'll be within walking distance to a famous local hike that overlooks Kanab. Located in the common room on grounds. Free to guests. Dining table in the living room/kitchen area. Seats 4 people. Kanab is central to the most famous national parks: Zion, Bryce Canyon, Grand Canyon North Rim. Also close to Lake Powell, AZ, and only 5 miles from Best Friends Animal Society! The Villa is located downtown, within walking distance to grocery store, restaurants, souvenir shops, coffee shops, and a great local hiking trail.